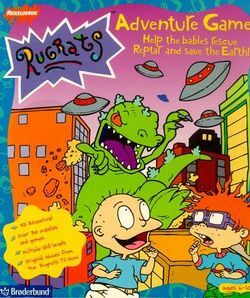 Rugrats is an American animated series that ran on TV channel Nickelodeon from 1991 to 2004 about a group of toddlers who have imaginative adventures when dealing with everyday life experiences, often without adults' awareness of their actions. The show, which was produced by Klasky Csupo, was immensely popular during its run, earning itself three theatrical feature films (The Rugrats Movie, Rugrats in Paris: The Movie, and a crossover with The Wild Thornberrys titled Rugrats Go Wild), two spin-off series (All Grown Up!, which was based on a special episode about the babies' lives ten years in the future and ran from 2003 to 2008, and Rugrats Pre-School Daze, which lasted for only four episodes that first aired in the United Kingdom in 2005), a star on the Hollywood Walk of Fame, and a number of tie-in media, including several video games. This page was last edited on 31 August 2017, at 01:27.